I adore the new Yukon Kitchen from Isla Gealach and Cheeky Pea. There have been a lot of great mesh kitchens released in the past year, but I think SL needs more and more! 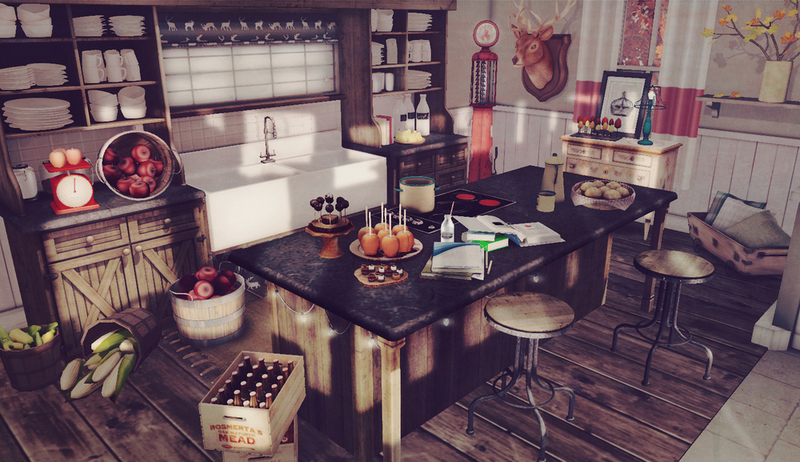 The Yukon Kitchen is wonderfully rustic and beautifully detailed...as Cheeky Pea always is. I really like how easy this is to set up - it's just two big pieces. Rez out the sink/cabinets...then throw down the island and BAM. KITCHEN. It's great for smaller spaces, and even if you don't have room for the island (which is perfection), you're still gonna get a great look from the sink and cabinets. All the white dishes are included, which is the perfect clutter, and then you still have the countertops left to add your own touches. Easy! Gorgeous! Perfect!